Mike Maker shares his overall offensive coaching philosophy as well as his time-honored strategies for attacking the man-to-man defense. 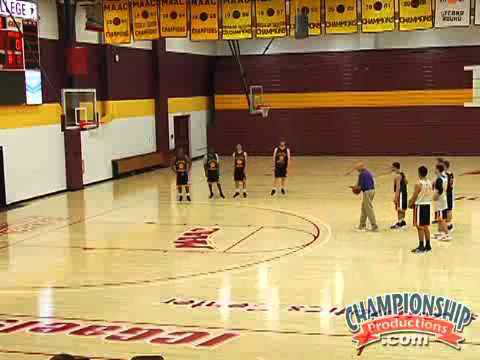 Using a hybrid Princeton style offense, he gives a detailed explanation of the use of pivots, reverse pivots and passing the basketball. His on-court demonstration continues with a "20 on 2" shooting drill designed to help players hit the net in a timed situation. He also demonstrates how to work players in 3-on-0 and 4-on-0 situations before tying the fundamentals together in a 5-on-0 setting. His Princeton style of play emphasizes quick slips, ball screens, pick and pops, post ups and back cuts. Coach Maker also shows how to integrate two good post players into this system and use their talents effectively. Though he touches on the development of his defense, the emphasis here is on practice strategies for enhancing the offense. If your players could benefit from tips for screening and cutting or if you need a new plan for running an effective man-to-man offense, the attack strategies in this detailed DVD are just what you need.